Identification: Stefanovic (1966), Kottelat and Freyhof (2007). Native Range: The Ohrid trout is native to Ohrid Lake located in the Republic of Macedonia in Europe (formerly Yugoslavia) (Robins et al. 1991b). Table 1. States with nonindigenous occurrences, the earliest and latest observations in each state, and the tally and names of HUCs with observations†. Names and dates are hyperlinked to their relevant specimen records. 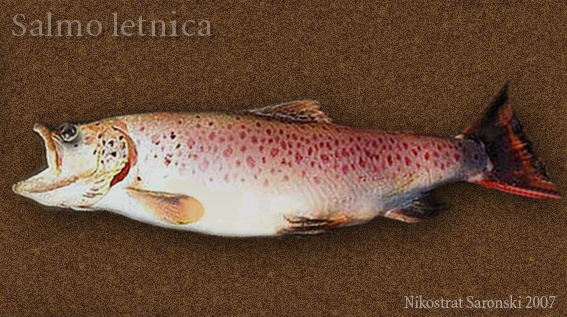 The list of references for all nonindigenous occurrences of Salmo letnica are found here. Means of Introduction: The Ohrid trout was brought into the United States by the U.S. Fish and Wildlife Service and shipped to a federal hatchery in Iowa and a state hatchery in Minnesota (Courtenay and Hensley 1979a). In 1965, eggs from Yugoslavia were hatched in the United States; young fish were released into several small lakes in northern Minnesota in 1968 and 1969 (Stroud 1969). Ohrid trout have been stocked in Tennessee since 1971 (Etnier and Starnes 1993). The species was first stocked in Colorado in 1969 (Wiltzius 1985). Status: Introductions into most of these states failed. Repeatedly stocked in Tennessee with no evidence of reproduction yet (Etnier and Starnes 1993). Courtenay and Hensley (1979a) report that even though there has been no reproduction, spawning has been observed in Tennessee. Remarks: A state record-sized fish was taken from the North Platte River in Wyoming in 1986 (Wyoming Game and Fish, Fish Division 1997). MacCrimmon, H.R. and J.S. Campbell. 1969. World distribution of brook trout, Salvelinus fontinalis. Journal of the Fisheries Reserearch Board of Canada. 26:1699-1725. Radonski, G.C., N.S. Prosser, R.G. Martin, and R.H. Stroud. 1984. Exotic fishes and sport fishing. 313-321 in W.R. Courtenay, Jr., and J.R. Stauffer, eds. Distribution, biology and management of exotic fishes. Johns Hopkins University Press, Baltimore, MD. Robins, C.R., R.M. Bailey, C.E. Bond, J.R. Brooker, E.A. Lachner, R.N. Lea, and W.B. Scott. 1991. Common and scientific names of fishes from the United States and Canada, 5th edition. American Fisheries Society Special Publication 20. American Fisheries Society, Bethesda, MD. Stefanovic, D. 1966. Racial and ecological study of the Ohrid salmonids. NOLIT Publishing House, Belgrade, Yugoslavia translated/published for U.S. Department of Interior & National Science Foundation, Washington, DC. Stroud, R. H. 1969. Ohrid trout tests. Sport Fishing Institute Bulletin 210:7-8.